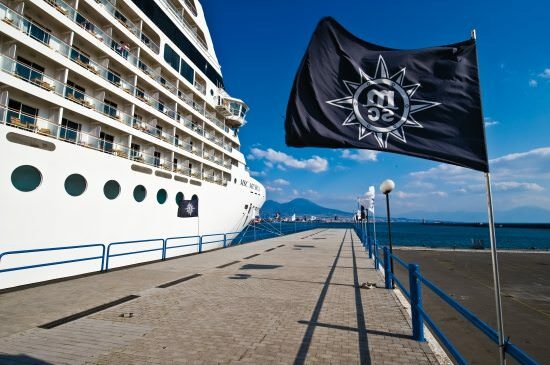 The first megaship ever built for MSC (in 2006), the 92,409-ton, 2,550-guest Musica launched the line’s modern era and put it in the ring alongside the cruise industry’s other players, in particular European rival Costa Cruises. 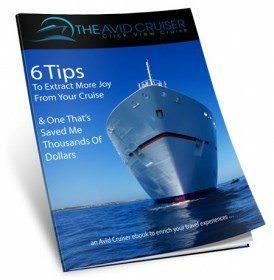 Designed with a very showy style — one part Vegas, one part Italian opera house, one part Mediterranean resort, and one part classic cruise ship pizzazz — she offers multiple dining options (including a great sushi bar), a knockout theater, an elaborate spa, a wine-tasting bar, and a great, expansive, social pool deck. Boarding guests enter into a bright, three-deck atrium that’s all curving lines, polished tile, etched glass, and gleaming brass handrails, all centered on a backlit two-deck waterfall and beneath an LED-illuminated ceiling of stars. A pianist performs regularly on a transparent baby grand that sits on a glass platform just above the water, and shops, an Internet center, a card room, a small library, an Internet center, an art gallery, and several bar/lounges cluster around or near the atrium on its various levels. Among the latter are the clubby Havana Club cigar bar and L’Enoteca Wine Bar, lit by faux skylights and serving more than 75 wines from all over Italy, with cheeses and meats to match. Most of Musica’s public rooms are located the two upper atrium decks. On level 2 (“Brilliante Deck”), the lively Il Tucano lounge is the venue for daytime activities/demos and evening music and dancing. Check out the great wall murals depicting its namesake bird. Farther forward and spanning three decks, Theatro La Scala is done up with the red-upholstered seating of its Milanese namesake, along with splashy art deco detailing and a plethora of glittering wall and ceiling lights. 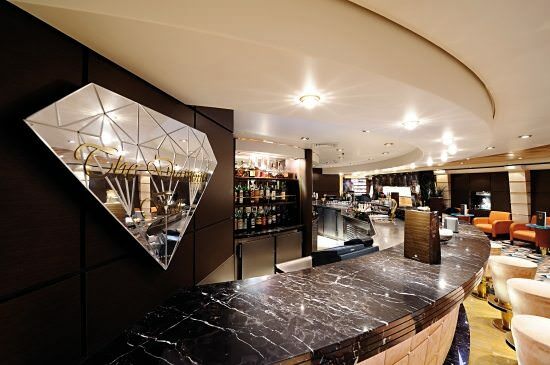 Maestoso Deck offers a large casino and the Crystal Lounge, a show lounge that serves (among other things) as the ship’s karaoke bar. Up at the top of the ship is the busy, very disco looking Discoteca 032, while one deck down (and all the way at the other end of the vessel) is the Aurea Spa, which offers two ornate Turkish baths (one for men, one for women) and a lovely pre- or post-treatment relaxation room where a row of flowing lounge chairs and three whirlpool tubs face a wall of glass and the open sea. There’s also a juice bar, a smallish gym, a beauty salon, and the usual menu of massage, wellness, and beauty treatments. Kids get the space-themed “Space Trip” playroom, outfitted with games, arts and crafts supplies, PlayStations, etc., and offering activities like puppet shows, group games, pizza parties, and acrobatics lessons. Outdoors, there’s a second, enclosed play area with a tube slide and a wading pool. Up on Vivace Deck, two Mediterranean-themed pool areas (each with a pool and two Jacuzzi tubs) are divided by a pair of pool bars. 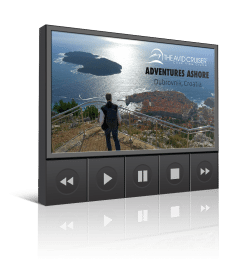 The forward pool area (“Area Picine Copacabanca”) has a large movie screen. Up top, there’s a jogging track, sports court, miniature golf course, and golf simulator. As aboard all MSC ships, dining is mostly traditional, with dinners served in the two fixed-seating main dining rooms: L’Oleandro, with its classic cruise ship restaurant look, and the more tony looking Le Maxim’s, with its art nouveau, fin de siècle Parisian decor. Both serve a combination of Mediterranean and international dishes, and both suffer from low ceilings, which amplifies ambient noise. For a more intimate alternative, guests can dine at the Kaito Sushi Bar, a beautifully designed, modern space that serves sushi, tempura, and other Japanese favorites, priced a la carte. For casual meals, there’s a buffet restaurant that in the evening also offers a nightly a la carte option in its aft section, as well as extra-cost pizza and kebab. There’s also a standard pool-deck grill outdoors, serving casual meals during the day. Most of Musica’s staterooms are 199-square-foot outside cabins with balconies, each designed in a clean, modern style, with adequate storage, a small sitting area, TV, minifridge, vanity/writing desk, private safe, and a bathroom with shower and minimal toiletries. 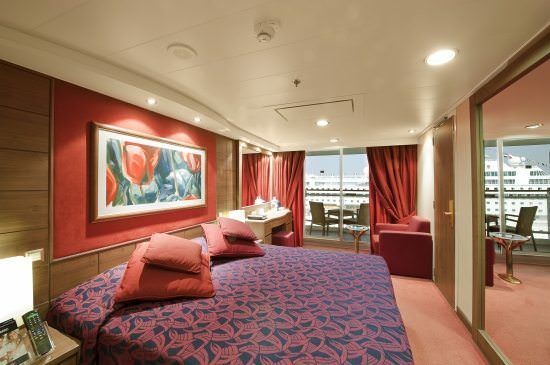 Smaller inside and oceanview staterooms are also available, as are 317-square-foot balcony suites, which come with a larger balcony, larger sitting area, king-size bed, more closet space, and a tub in the bathroom.